Due to the inclusion program at schools in North Rhine Westphalia, the need arose to organise guided tours through the museum in such a way that visually impaired participants could be included in the experience. The idea was to offer an additional level of experiencing information through touch, by creating individual purpose-made objects in combination with narratives depending on the educational objectives as a key term for a humane society that respects diversity. 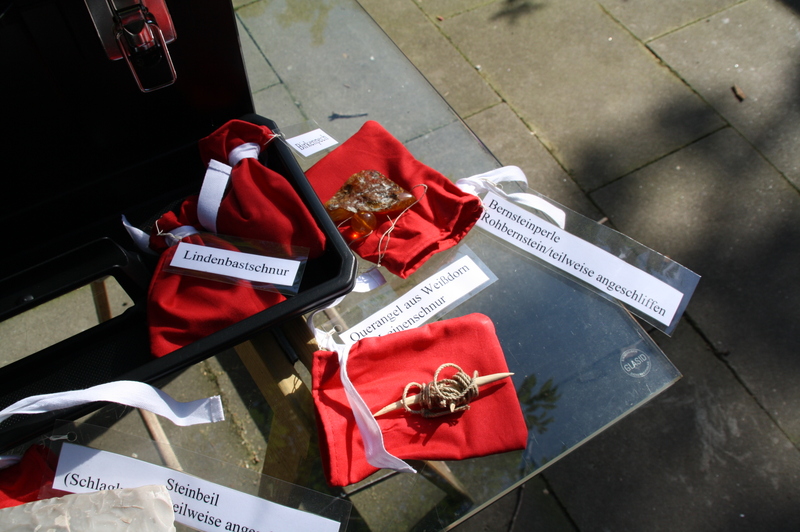 The measure is funded by the Westphalian Museum Office. For a clear structure we created a module system that was led by the introduced eras. In this way it is possible to adapt the tours to the customers. When visited by classes the content of the tours may be made available to the teachers/adapted to the requests of teachers on a case by case basis. An important role will be the planned length of the visit and the age of the pupils. On 16 October 2013 the Convention on the Rights of Persons with Disabilities (CRPD)passed in the North Rhine Westphalia parliament. Inclusion should be promoted as a key concept in a humane society that respects diversity. This value should be a fundamental consensus within society as a whole. As the aim was to include blind and visually impaired people—especially students—a new guided tour for the Museums area was designed. Besides sensory perception in the houses themselves, several objects complete the audio tour on a haptic level. Following is the theoretical concept and the eligibility criteria for the objects used. 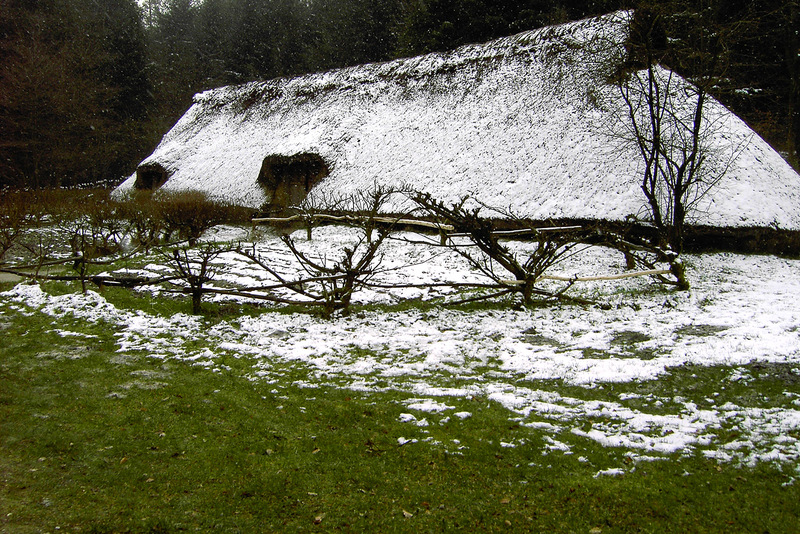 In the Archaeological Open-air Museum Oerlinghausen, you will find an extensive range of museum education that has been supervised and managed since 1989 by Jutta Deitermann. The inclusion concept is planned to be an additional education medium, which is based on my wide expert knowledge transfer for which Wulf Hein publicised the term Archäotechnik (archaeotechnique). Incorporated in the theoretical concept are the results of my academic work on popular images of history. While explaining history with the help of objects is not a new idea, this approach is new in the way it is narrated. The guided tours should also include aspects of social history and theoretical and methodological questioning (Schmidt 2000, 86). The main focus of the inclusive guided tour will of course be the houses in the museum area. The Stone Age is represented by the 1978/79 assembled building of the Rössener Culture (4500-3900 BC). 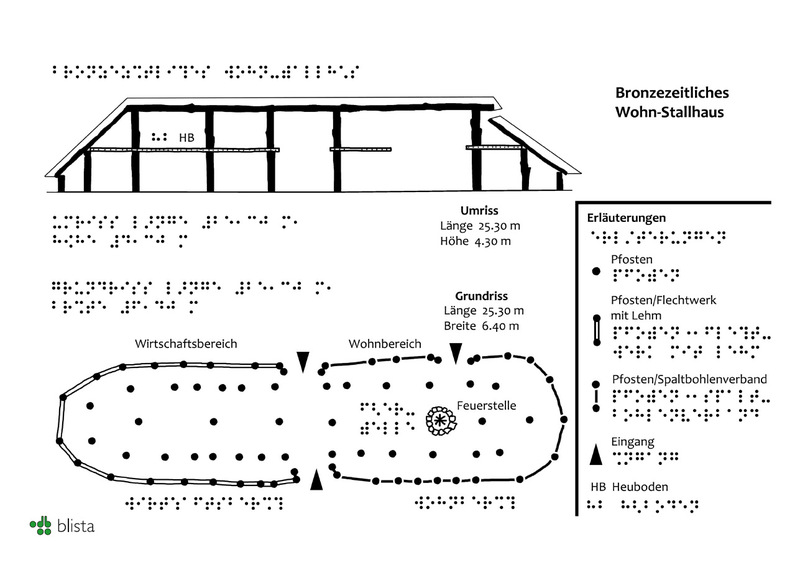 The Bronze Age is represented by a house built after a pole floor plan from Telgte/Münsterland, and the Early Middle Ages by a house reconstructed in 2006 after findings from Halle/Westfalen. Tactile diagrams of floor plans in Size D in A3 are available for all these houses. A script is provided to the staff to acquaint them with the contents and the story lines. For each era three modules were drafted: Everyday life, Life style and unknown cults and burial rites. The modules are based on questions regarding historical and material traditions. The texts are drafted based on the following questions: exchange of goods, tools, and jewellery. Included in the texts are the descriptions of the reconstructed objects. The objects should be handed around, touched and viewed. The texts should be considered as a guideline and offer possibilities to embed the objects into the narratives of the storyline. Story lines for the texts should be treated as stage directions, but should also indicate what type of narration should not be used in order to critically point to the limitations of cognition possibilities. An example of this is the assigning of archaeological finds to a modern nation. Classification: Early Middle Ages (seventh century). Up until 1988, 24 fragments were found in Westphalia, in the periphery of the northern distribution area for Glass arm rings. A La Tène C and D date range has been considered for this object (circa 20-15 BC). Three of the fragments presumably belong to much later contexts: they were found separately in a backfilling of a Saxon sunken house (Münster Gittrup) remains of a settlement (Soest, Thomäestraße) and inhumation grave from the seventh century (Lankern). The fragment of the glass arm ring from Lankern had a drill hole and was part of a bead necklace. This fragment is a very special discovery. The piece was already some centuries old when it was found. While it is not clear what kind of desires and ideas are associated with the artefact, it is a starting point for an exciting story. Today field surveys and reports of findings are standard practice. In the case of this example however, it is possible to permit assumptions surrounding the methods of archaeological research. According to Christian beliefs, the living, the dead, and those that will be born will one day form a community. For the deceased, an afterlife and a resurrection on judgement day was promised. From Late Antiquity, these ideas coming over from the Alps were completely new. These beliefs were considered to be so important that the need for their dissemination and teaching became widespread. Christian missionaries travelled to many countries all over the world. The new belief was also shared by many mighty sovereigns and was a subject matter of political and martial conflicts, constraints, and violence. Christianity in the Early Middle Ages would also be considered strange to contemporary Christians. Today we do not bury the deceased with their smart phone or car. Men and women both join the Lord's Supper. Scientists concern themselves with researching former ideas and also include the results of archaeological research. We know very little about the concept of beliefs of the people in East Westphalia in the Early Middle Ages. The world of ideas cannot be ascertained through traces in the soil. There are records from Scandinavia that originated much later and not through common people, but through monks who made the world accessible in a very different way. Many of these ideas seem very strange to us today, such as burying pets together with the deceased. 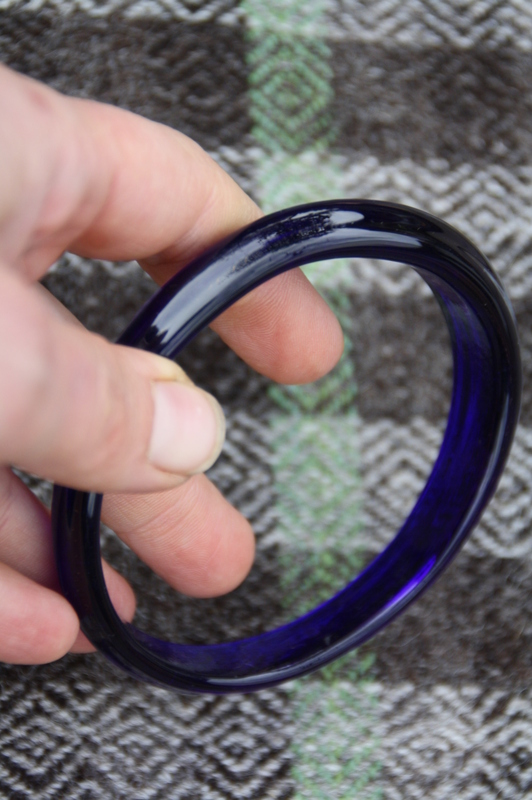 Fragments of blue glass arm rings that were already some hundreds of years old before deposition, were collected, stored and laid into the grave. Among the findings was also an ammonite with a drill hole. Maybe these were good luck charms? The reconstructedobjects illustrate the transfer of knowledge and contain the following materials: wood, fabric, pottery, metals, glass et cetera (See Figure 3 and 4). As far as possible, the templates were chosen from artefacts from North Rhine Westphalia. These templates will be adapted to the requirements of the visitors and can be taken into the museum on a trolley. 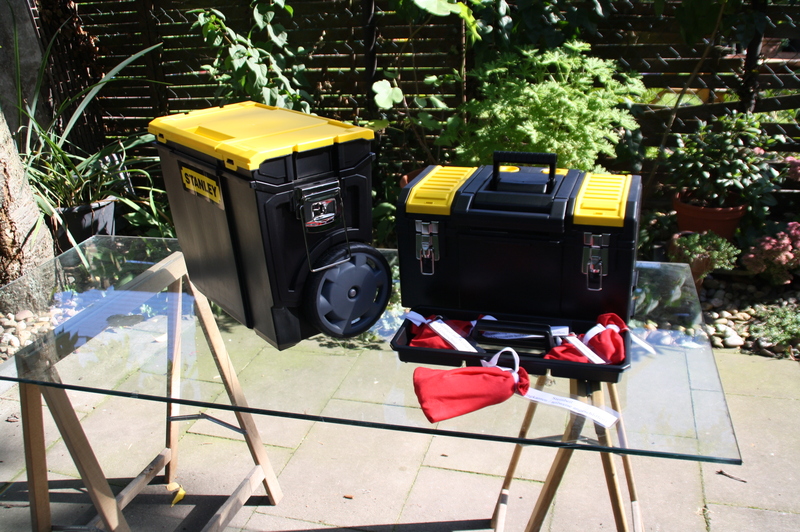 A list of materials serves as a survey and makes it easy to choose the required objects. Padded pouches and solid plastic containers ensure the secure transport of delicate items. Each pouch has a different colour that relates to a different era. Haptic communication and the quality of the replicas were the reasons for the following excursion to the history of museum transfer of knowledge, because replicas are used in different contexts for a long time. The reconstruction of archaeological findings to decrypt manufacturing techniques (Keefer2006, 12) and for descriptive instructions in the context of the approach to progressive education (Hager2007/2008) has been used for more than one hundred years. In Oerlinghausen the methods in progressive education were implemented by Hermann Diekmann, who started school teaching on the 1 April 1920 (Banghard 2015, 97). He was very interested in prehistory and protohistory and educated himself on the topics. He later campaigned for the foundation of the open-air museum. In May 1936, the Teutonic Farm Building Oerlinghausen (Germanengehöft Oerlinghausen) was established; institutionally tied to and supported by the Reich Education Ministry (Reichserziehungsministerium) and the Reichsbund für Deutsche Vorgeschichte (Reich Federation for German Prehistory). Rebuilding tools, furnishings and fixtures, and items of everyday life played an important role in the transfer of knowledge. During the NS government the reconstructions matched their ideological guidelines (Crumbach 2014, 52-53). In the pattern shop of the Reich Society for German Prehistory in Unteruhldingen, one could order replicas composed from different materials: wood, pottery, metal, stone, et cetera (Reinerth1942). Liebtraut Rothert describes the requirements for replicas in 1936 as follows: Genuineness of the basic material, absolute accuracy to the original object and flawless manual realization (Rothert 1936, 30). Together with this pattern shop she created the concept for the biggest archaeological exhibition during the Nazi regime, which was shown in many German cities from 1938 onunder the title Lebendige Vorzeit (Vivid prehistoric times) (Halle 2013, 180). This exhibition had more of a character of a propaganda campaign and presented ideologically twisted contents (Schöbel2008, 165). The vivid presentation and the impression of qualitative high-graded teaching materials. Empathic connections to the ancestors should help to get in touch with the attributes given to the past by the Nazi regime. We now benefit from hundreds of years of experience in making models and replicas of artefacts. Excellent publications and a broad selection of workshops are available in the textile sector, for stone, and metal works, but also for lots of other interests. The Internet offers the possibility for international dissemination and extensive historical investigations. Not least series like the annual publications of EXARC are an excellent and informative medium for exchanging information. With a bit of practice and operational experience combined with sound project funding, one can create displays of high quality illustrative objects. The material basis—objects and buildings, and especially tactile diagrams—are only one aspect of our proposal. The other is the non-haptic: the knowledge and the content. Often obsolete research paradigms are used attract the visitors’ attention. Here it is recommended that content should be critically scrutinized and that a thesis is only possible if the guided tours are kept up to date and scientific discourses are being reflected upon and included. BINDING, U. 1990: Glasarmringe in Westfalen. In Trier, B. (Hrsg. ), Ausgrabungen und Funde in Westfalen-Lippe, Jahrgang 6 Teil A, Mainz am Rhein: Vrelag Phillip von Zabern. pp.41-46. CRUMBACH, S. 2014: Zurück zu unserem Cheruskerhof! Anschauliche "Kulturhöhe" im Germanengehöft auf dem Barkhauser Berg, Oerlinghausen. Loogh: Welt und Erde Verlag. HALLE, U. 2013: Frauen in der Ur- und Frühgeschichtsforschung zwischen 1933 und 1945 - zwei Karrieren. In Fries, J. E., Gutsmiedl-Schümann, D. (Hrsg.) Ausgräberinnen, Forscherinnen, Pionierinnen. Ausgewählte Porträts früher Archäologinnen im Kontext ihrer Zeit, Münster, New York, München, Berlin: Waxmann, pp. 169-217. KEEFER, E. 2006: Zeitsprung in die Urgeschichte; Von wissenschaftlichem Versuch und lebendiger Vermittlung. In Keefer, E. (Hrsg.) Lebendige Vergangenheit; Vom archäologischen Experiment zur Zeitreise. Stuttgart: Konrad Theiss Verlag GmbH.pp. 8-37. REINERTH, H. 1942: Lebendige Vorzeit: Arbeiten des Modellwerkstatt des Reichsbundes für Deutsche Vorgeschichte. München: Graphische Kunstanstalten F. Bruckmann KG. ROTHERT, L. 1936: Kampf dem Gips!. Germanen-Erbe(1), pp.28-32. SCHMIDT, M. 2000: Museumspädagogik ist keine Experimentelle Archäologie. In Fansa, M. (eds.) Experimentelle Archäologie und Museumspädagogik, Archäologische Mitteilungen aus Nordwestdeutschland. Beiheft (29) pp.81-89, Oldenburg: Isensee Verlag. SCHÖBEL, G. 2008: Hans Reinerth (1900-1990) - Karrier und Irrwege eines siebenbürger Sachsen in der Wissenschaft während der Weimarer Zeit und des Totalitarismus in Mittel- und Osteuropa. Acta Siculica pp.145-188. Book Review: Management of Open-Air Museums. Workpackage 2: “Improvement of Museum Management” by Jakobsen, B & Burrow, S (eds).